To the right, you'll find a printable card [I created] for when you say the novena. 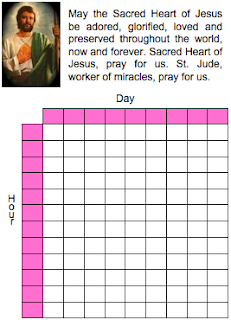 The "novena card" has a picture of St. Jude, the novena, and a table in which you record the days and hours of each recitation. It's discrete; you can carry it in your pocket, purse or wallet. Right-click the image and "Save Image As..." to your desktop (or a folder elsewhere in your computer). Print the card. Cut the excess paper from around the card's borders. Fold as you wish. Let's say you start the novena on the 15th at 7 am. Write the numbers of 9 consecutive days in the 1st row, starting on the 15th and ending on the 23rd. Write the consecutive hours of the day in the 1st column, starting from when you want to begin the novena each day (e.g., from 7 am to 6 pm). When you recite the novena, mark the appropriate square. When you've marked 9 squares on a given day, you're done. I hope this is helpful as you pray to St. Jude. Wow this is nice! My son is in a very hopeless situation right now and I think St. Jude is the only hope he has.Thanks for your extra effort.May your prayers be answered and you have everlasting peace in your heart. This is really nice.This card will help in much in a sad mood.This card really can create spiritual sprite for me. This is really nice. This card will help in much in a sad mood. This card really can create spiritual sprite for me. This is very nice, thank you. May you be blessed for taking the time to share this. I thank you God for giving me several answer in my life.I've already got some important answer for my life with this prayer and I believe that for the people who believe in God will have the advantage of praying with this novena.May God bless you. Thanks. Prayer to St.Jude has created wonders in my life...I had prayed it hardly 4 days within which my prayer was answered....Thank you St.Jude...definitely i will keep spreading this...Thanks to u for creating this card.. i pray God almighty to shower his blessings on you and ur family.. Thank you St. Jude. I prayed the novena to get my daughter a job as a teacher which is hopeless in California -- as there are so many laid off. The day I finished the novena -- she was called for an interview and got an offer that evening. Again, I prayed the novena for my son -- and the next day after I finished the novena, he was offered a job. This novena works. We are in need of help to find good housing. I am pray to St Jude to help us make the move to a new dwelling on Sept 1. Please pray for me and my family. Its be only a few hours since my first post. In regards to moving. I have pray to St. Jude for just the last two days and things are looking up. We have a new place will be in by the 15th. thank you st.jude for always being here for me and my family. Your guidance is always very helpful. Thank you St. Jude for always being there for my family. The novena is really short.... So why from 7 am to 6 pm? Thank you St. Jude for listening and answering our prayers. Please continue to keep my family healthy and strong. Nina H.
oh Dear St. Jude, i invoke your name to intercede for me. Shine a light to my finances, a job. i Have no one else to turn to. i beseech your kind heart that i shall be restored from the overbrearing debts. Thank you oh dear patron saint. St. Jude, please help my wife with her depression. She's threatening divorce, and we have young children. Please, please help. and getting me out of big mess I made for myself. St. Jude has never failed helping me when I mess up. Please dear saint Jude for Anthony,s and Kathleens Depression. Need Money and Help to move back to Baltimore.Amen BE with our Family.Thank you Saint Jude THADDUS> AMEN. thank you St Jude for interceding for our family to stay together.